Portraits of “trailblazers” l-r; Perry Wallace, Rev. James Lawson and Rev. Walter R. Murray, Jr. are three of the four honored by Vanderbilt University in its Portrait Project. Photo submitted. NASHVILLE, TN — Vanderbilt University has been taking a hard look at its own history and challenges faced by its African American students and faculty. “There are these figures who have been overlooked who made Vanderbilt a better institution,” said Nicholas Zeppos, Chancellor of the university. Recently, the university honored a group of “Trailblazers” with a series of portraits along with other honors such as named buildings, fellowships and scholarships. Vanderbilt commissioned noted African American portrait artist Simmie Knox to paint portraits of four trailblazers who “broke barriers at the university and changed society.” The portraits honor Rev. James Lawson, Bishop Joseph Johnson, Rev. Walter R. Murray, Jr. and SEC Conference basketball star Perry Wallace. 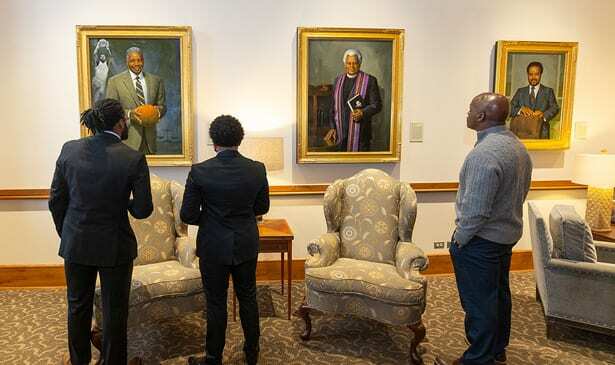 The portraits were unveiled last month at an alumni function and currently are displayed in the administration building along with portraits of past chancellors. Two of the honorees, Walter Murray and Perry Wallace, grew up in Nashville. “The trailblazer portrait series is really a part of a larger project of examining Vanderbilt’s history and looking back to see the obstacles that were there for African American students,” said Nicholas Zeppos. “These were people who stood up and said ’I want to be part of Vanderbilt University.’ These also were people who stood up against hatred, bigotry, racism, threats of violence and violence. When Jim Lawson went down to participate in sit-ins and used the techniques of non-violence, people spat and threatened him. These are people who basically changed America,” said Zeppos. Ironically, Lawson was expelled from Vanderbilt when he led Nashville lunch counter desegregation sit-ins, but later the University repaired that relationship and Lawson returned in 2006-2009 to serve as Distinguished University Professor at the Vanderbilt Divinity School. Bishop Joseph Johnson was the first African American graduate of Vanderbilt University and the first African American to earn a doctor of philosophy degree. He was a professor of religion at Fisk University and the 34th bishop of the Christian Methodist Episcopal Church. He was elected to the Vanderbilt Board of Trust in 1971. Rev. Walter R. Murray Jr., another pioneer African American student at Vanderbilt, was elected president of the Student Government Association and founded the Afro-American Student Association. He later founded the Association of Vanderbilt Black Alumni and also broke barriers by serving on the Vanderbilt University Board of Trust. Zeppos pointed to Dorothy J. Wingfield Phillips who was the first African American woman to graduate from Vanderbilt University. “Another trailblazer we’ve honored by way of endowed fellowships is Dorothy Phillips. She grew up near Centennial Park. Her father was a doctor.” The Dorothy J. Wingfield Phillips Chancellor’s Faculty Fellowships currently supports two African American women who are midcareer and leaders in diversity in STEM at Vanderbilt. The university also established the James M. Lawson Jr. Chair and, in 2018, a James Lawson scholarship for undergraduate students. In 2014, Vanderbilt named Smith Hall, a new residence hall on the main campus, as a tribute to the late Rev. Kelly Miller Smith, who was a leader in Civil Rights in Nashville and served as assistant dean of the Vanderbilt Divinity School from 1969-1984. Another residence hall and memorial lecture were named in honor of Rev. Walter R. Murray, Jr.
Kirkland Hall is open to the public during the week from 7:30 am-5 pm.